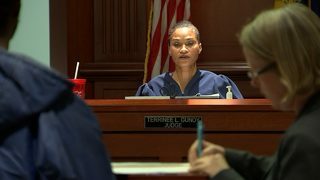 Channel 2 Action News has learned that the state agency which oversees judges is investigating an Atlanta judge whose work habits and judicial conduct have been the subject of complaints. Investigative reporter Richard Belcher says one incident includes a Super Bowl pep rally. The judge in question is Terrinee Gundy. Former mayor Kasim Reed appointed Judge Gundy to the municipal court bench in 2013. She is one of two judges who hold 8 a.m. sessions for defendants jailed overnight. Scores of defendants, most poor, many mentally ill, are brought from jail to face relatively minor charges, such as public urination or disorderly conduct before Gundy. Early last year, she took a break one day, but not to handle other court-related work. 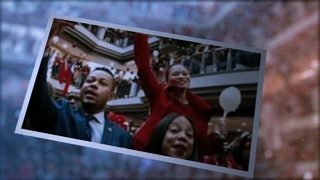 Instead, she went to a Super Bowl pep rally for the Atlanta Falcons at City Hall. A picture from a court-related website shows Gundy at the pep rally. Belcher was told she did not hold court that day. Belcher has learned that incident is one subject of an investigation by the state judicial qualifications commission or the J.Q.C. "Folks know Gundy to not show up, to postpone or to cancel court," Mary Hooks told Belcher. Hooks works with the defendants’ advocacy group Southerners On New Ground or S.O.N.G. She spoke more openly than most about Judge Gundy and the impact if court is delayed or canceled. "I mean, it's real simple: people have to go back to the cage until they have another court," Hooks said. A whistleblower gave Belcher documents, which are among those provided to the JQC. They include notes from a court insider showing Gundy's arrival times at the court. Most are well after 8 a.m. when her court is scheduled to start. And another document shows some of days when other judges had to work for Judge Gundy early 2017. Belcher confirmed the state investigation from Rosalie Joy, who was chief public defender in municipal court for seven and a half years. "I am aware that there is a JQC investigation. I am not at liberty to discuss whether I have been interviewed by the JQC," Joy told Belcher. Also under investigation is the time last year when Joy's office had to file an extraordinarily unusual motion just to get ten defendants an initial hearing before Judge Gundy. Lawyers know it as a habeas corpus petition. Joy says that was an extreme example of a problem that defines the overcrowded municipal court, especially for poor defendants. "Because the numbers are so staggering, we do have a system in Atlanta that can be likened to assembly line justice," Joy said. Joy says her tenure as chief public defender turned rocky when she began insisting that her lawyers get more aggressive, which sometimes meant demanding hearings on issues. She says Gundy and other judges too often set those hearing for weeks later. Belcher asked Joy if Judge Gundy and her colleagues need to work harder. "If cases require that judges need to stay on the bench long enough to ensure that everyone is afforded due process, then, yes, they need to work harder," Joy said. Joy says Gundy was the driving force to persuade Reed to remove her last year. The move succeeded. Joy left the court and has taken a job in Washington, D.C.
She says she can live with what she accomplished in Atlanta. "We stopped the assembly line justice system. I cultivated a staff of attorneys who are no longer afraid to stand up for what is right in the courtroom despite the fact that they could fear the loss of their job," Joy said.